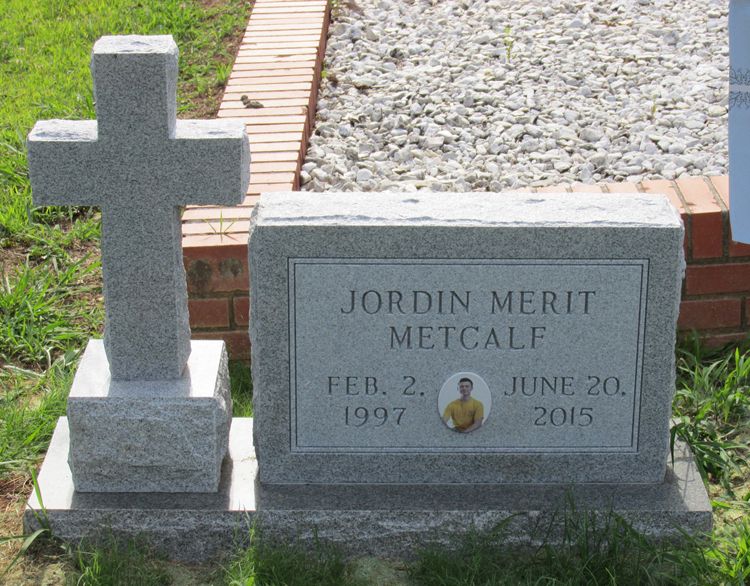 Jordin Merit Metcalf age 18 of Waleska, GA passed away Saturday June 20, 2015. Funeral Services are scheduled for 2:30PM Friday June 26, 2015 from Canton First United Methodist Church with interment to follow in the Old Macedonia Campground Cemetery. Reverend Jim McRae will officiate. Visitation hours will be Thursday June 25, 2015 from 2:00PM- 4:00PM and 6:00PM- 8:00PM at Darby Funeral Home. Jordin is survived by his father and mother; Rod and Amy Metcalf, Waleska, GA, brothers; Johnathan Metcalf, Waleska, GA, sisters; Nikki Rogers, Acworth, GA, Chesley Brown, Acworth, GA, Grandparents; Harold and Judy Metcalf, Shepherd, MI, Joseph Meyer, Canton, GA, birth mother; Lisa Rogers, Douglas, GA, aunt and uncle; Kerrick and Melissa Kontio, Holland, MI, and several cousins, nieces and nephews. The caring staff of Darby Funeral Home is in charge of these arrangements. The father of a Waleska teen who died this weekend said his son will be remembered for having a servant’s heart and an ability to make people laugh. Jordin Merit Metcalf, 18, of Waleska died Saturday when a truck hit him from behind while the teen was walking his bicycle on the side of a road in Cartersville, Georgia Department of Public Safety spokeswoman Tracey Watson said. The funeral service is set for Friday at Canton First United Methodist Church. Rod Metcalf and his wife, Amy, adopted Jordin and his older brother, Johnathan, in 2011, after the brothers spent a few years living at the Goshen Valley Boys Ranch in Waleska. “Jordin loved to laugh, he had an infectious laughter. He never met a stranger, he could have a conversation with anyone who was willing to talk to him. He had a huge servant’s heart,” the teen’s father said. Metcalf said Jordin loved the outdoors, loved his family and loved Christ. Jordin Metcalf also played on several recreational baseball and basketball teams and tried his hand at football. A few months ago, Metcalf said he had a talk with his son. During the talk, Metcalf said Jordin told him he knew Jesus Christ, he knew his father loved him unconditionally and he saw the opportunities his father had given him to be successful. Before the brothers became part of the Metcalf family, they lived at the Goshen Valley Boys Ranch in Waleska, a home for boys in the state foster care system. While at Goshen Valley Boys Ranch, Executive Director Zach Blend said he knew the brothers well. Blend said Jordin will be remembered for being bright and joyful, his infectious sense of humor and for putting a strong importance on his relationship with God. Jordin would always jump into service work at the ranch, and was a brother not only to his biological brother, but also to his fellow housemates, Blend said. Along with his service to the community and friendships with other boys at Goshen Valley, Blend said the Waleska teen also showed great bravery. Don and Terry Frazee were Jordin and John’s house parents at the ranch, and Blend said “in many ways” the Frazees prepared the brothers for the opportunity to be loved by their adoptive parents. Blend also said Jordin attended Liberty Hill Baptist Church in Canton during his time at the ranch, and said the teen was very involved with the youth group there. Many memories came to mind about Jordin, his father said. The family has a boat on Lake Arrowhead, and the teen loved water sports, his dad said. Metcalf said Jordin got back in the boat after learning to water ski and asked when he would be able to use one ski instead of two, and the father said he told Jordin it would probably be a couple weeks. The young Waleska man also loved to travel, Metcalf said, adding he was able to go on a few cruises and visit several other states in his life. Another memory Metcalf had of his son was once when he was in Atlanta ministering to homeless people. “I remember him grabbing the hand of a homeless man and leading the group of people he was with in a prayer for that man’s safety,” he said. When the last big snow storm hit the area, Metcalf said he and Jordin got stranded at Woodstock Middle School where the father is a counselor. He and his son ended up staying to help students who were stranded, and Metcalf said the other teachers commented about how Jordin was helping to serve the students and clean up after them. A funeral service is scheduled for Friday at 2:30 p.m. at Canton First United Methodist Church, at 930 Lower Scott Mill Road, with internment to follow at the Old Macedonia Campground Cemetery. the Rev. Jim McRae will officiate. Visitation is set for Thursday from 2 to 4 p.m. and 6 to 8 p.m. at Darby Funeral Home in downtown Canton. Jordin Metcalf is survived by his parents, Rod and Amy Metcalf; brother, Johnathan Metcalf; sisters, Nikki Rogers of Acworth and Chesley Brown of Acworth; grandparents, Harold and Judy Metcalf of Michigan, and Joseph Meyer of Canton; birth parents, Lisa Rogers of Douglas; aunt and uncle, Kerrick and Melissa Konito of Michigan; and several cousins, nieces and nephews. Copyright 2015, Cherokee Tribune. All Rights Reserved.